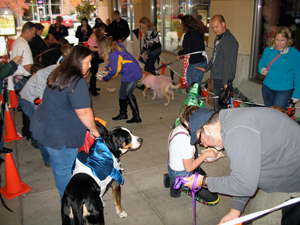 2012 Howl-O-Ween, "Tricks for Treats," Mill Creek Town Center. Photo credit: Paddywack Pet Supply, Mill Creek. Registered participants are provided with doggie treat bags and sent out with a map to trick-or-treat at several dog friendly participating merchants offering yummy treats for their pooches supplied by Paddywack. This year, there will be several “special” stops, including refreshments for the dog owners and a game center at “The Forum”. Artis Photography is sponsoring a photo stop, offering free photos of costumed pets that will be posted online where people can vote for their favorite costume. In addition, prize baskets will be offered to the dogs performing the best tricks. The event is limited to 200 dogs and all dogs must be pre-registered at the store to reserve a spot. There is a nominal fee of $10 to participate and 100% of the funds will be donated to a non-profit pet rescue group. Don't miss out on this spooktacular event! All proceeds from Howl-o-ween this year go to FurKidz 911 Connection, an organization that serves as a resource for animal shelters who are in need of saving a dog from being euthanized or when shelters are overcrowded. The organization is foster-based and has a team of fosters throughout Western Washington. FurKidz is dedicated to the rehabilitation of dogs so they may find their forever home.